The Youth Development Section of Ballincollig GAA Club which caters for children in the U-6 to U-12 age groups will commence training this Sunday 5th February 2017. The U6 and U7 group will train on the Astroturf in Gaelscoil Ui Riordan. Please check with the managers listed below for details. The U8 to U11 groups will train on the pitch in GAA club from 10.30 to 12.00 for this sunday only. From Sunday Feb 12th training will be from 11 to 12.30. 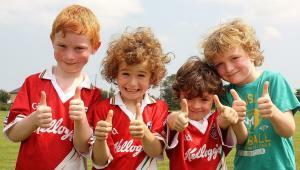 This Sunday morning the U5, U6 and U7 groups will train on the AstroTurf in Gaelscoil Uí Riordain. Please bring water, wear runners, and bring a Hurley and helmet. The start and finishing times are list below. Please arrive early to training.